Imagine if The Beatles never wore those collarless suits, or if Madonna never wore a tattered wedding dress on MTV. What if David Bowie had never thought to transform into Ziggy Stardust, or Cher had never worn that glittery body stocking under a leather jacket on a Navy ship? No meat dress for Gaga, no ruffled shirt for Prince, no cape for James Brown, no trash bag jumpsuit for Missy Elliott. Bowie’s clothes have facilitated his shape-shifting personas and dedication to androgyny. 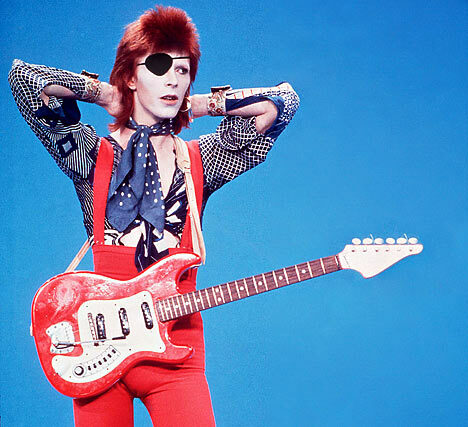 His looks are an extension of who he is artistically, and thus, most periods of his work are mirrored in distinct looks: the buttoned-up mod known as David Jones and his subsequent dip into bohemia, the space-age glamazoid Ziggy Stardust, the tailored gender-bending of The Thin White Duke, the hardened edge of Berlin, the Klaus Nomi obsession, the pastels and pleated pants of his 1980s commercial peak, the little goatee and spiked hair of ’90s Bowie, and on and on. Who makes a red mullet, suspenders, platform boots, and an eye-patch look good? How is that even possible?